The TI-84 Plus is the most widely used calculator on the ACT and the best version is the TI-84 Plus CE. Click the button below to see it on Amazon. No stylus or pen based devices, so no tablets like an iPad or Nexus. No calculators that have a computer-like “QWERTY” keyboard. Even though the latest TI-Nspire models have had full keyboards for several years now, you will notice it is alphabetical, not QWERTY, like a computer. What Calculators Are Acceptable on the ACT? What Calculators are prohibited on the ACT? Can I Have a Backup Calculator on the ACT? One important note on the ACT rules–you are allowed to bring more than one calculator. You can only have one out at a time, but you can switch whenever you feel like it with the spare you have under your desk. I would strongly advise you to bring a backup calculator in case your primary has a problem. For more info: ACT’s FAQ page. If you are looking for some additional ways to prepare for the ACT, check out my post on the best ACT prep courses. Regardless of whether you are looking for some last minute cramming or to bulk your skills up over the course of a weeks or months, there’s a program for you. Thinking of taking the SAT? 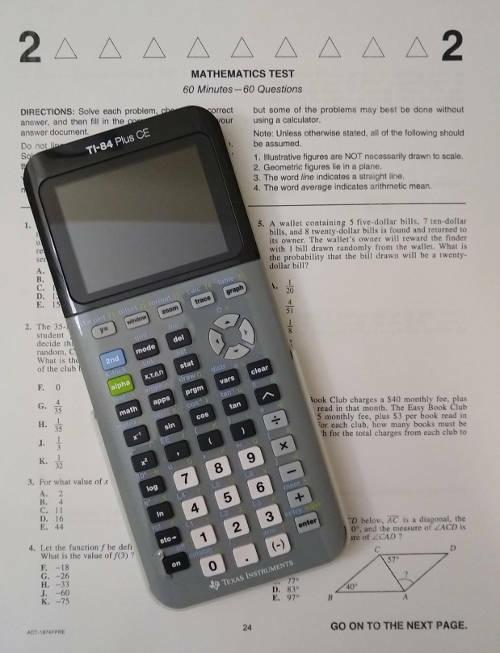 Check out my post on calculators for the SAT.